The supernova hot New York Mets return home this weekend for a three-game series against the Boston Red Sox. The Amazin’s have lived up to their name as-of-late, compiling a six-game win streak and cementing a 6.5-game lead over the Washington Nationals atop the NL East. With the Red Sox making their maiden regular season trip to Citi Field (the team last played an exhibition game there in 2009), Mets tickets are finding a healthy demand on the secondary market. According to TicketIQ the average price for Mets vs Red Sox tickets over the three-game affair is now $122.34 on the secondary market. The series will be abundant with fan giveaways, as shirts, bobbleheads and toy trucks are being offered through the weekend. The excitement kicks off on Friday night when Matt Harvey takes the mound against Henry Owens. Friday Mets vs Red Sox tickets currently average $117.17 and the cheapest ticket is listed for $31. The game will run in conjunction with the team’s “Free Shirt Friday” campaign, which awards all fans in attendance with a specially-designed t-shirt for that night. On Saturday night, Jacob deGrom will face off against Joe Kelly in the highest-priced game of the series. 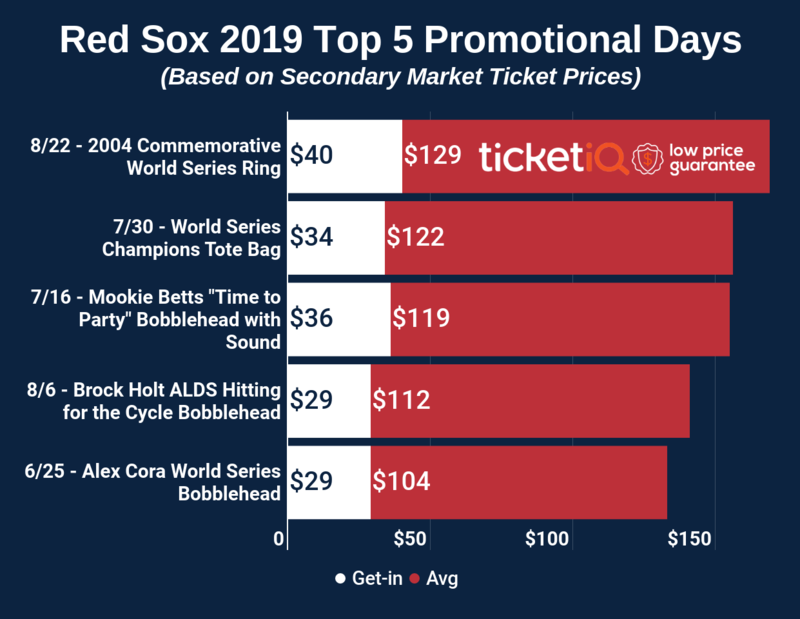 Saturday Mets vs Red Sox tickets own a secondary market average of $212.18 and a $79 get-in price. The Mets will pay tribute to their 1986 World Series victory over the Red Sox by giving away a Jesse Orosco bobblehead to the first 15,000 fans in attendance. The rubber game of the series will be held on Sunday afternoon when Noah Syndergaard gets the nod against Wade Miley. Tickets average $108.47, the cheapest of the series, and the get-in price starts at $31. A toy truck presented by W.B. Mason will be presented to the first 15,000 fans. The Mets will enter this weekend’s series hoping to separate themselves even farther from the Nationals in their pennant race, who have also played strong as-of-late. A postseason berth would be the team’s first since 2006, when they ultimately fell to the St. Louis Cardinals in seven NLCS games.